It had been a terrible week filled with long days at work spilling into overtime. Then I picked up Hitman: Absolution, put on my Agent 47 suit, killed some people, and immediately felt better. Check out the review. Let's get full disclosure out of the way. I am a Hitman virgin. I played the first game for about half an hour a long, long time ago at a friend's house, and I was absolutely terrible at it. Being a student, with very little money, I decided against buying it. It's a decision I regret, but hopefully I can make up for it when IO Interactive eventually release the Hitman HD collection. Luckily, once I'd discovered I was the only one available to pick up a review copy of Hitman: Absolution it didn't take me long online to get up to speed with the story, not that it matters, as this game can pretty much stand on it's own two feet. It had been a terrible week filled with long days at work spilling into overtime as I wrestled with a particularly finicky website that refused to work properly on Internet Explorer. When I finally got a chance to pick up my controller, I was barely conscious, eyes glazed over, ready to collapse. Then I started playing. For fans of the previous game, the top down real time map has now been replaced by an Instinct view, which isn't dissimilar from Batman: Arkham Asylum's Detective Mode. 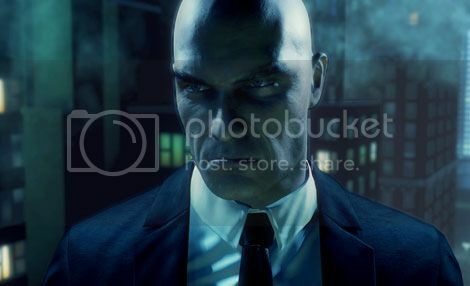 You're still very much seeing the world through Agent 47's eyes (or at least somebody looking over his right shoulder). All important NPCs are highlighted, and their movement can be tracked - however, there is a catch. If you stay in this mode for too long, your instinct will run out, and you will need to pull off some assassin badassery (headshots, silent assassinations, the usual fare) to fill the meter up again. Why is instinct helpful? Well, as mentioned before, it allows you to predict your enemies' movements, walk past NPCs who can blow your disguise (if you're dressed like a cop, other cops will recognise you as a fake and raise the alarm), and to activate the sick point shooting. With the last one, think Red Dead Redemption, but to pull it off you absolutely positively have to kill every mother------ in the room, otherwise your cover will be blown and you WILL find yourself in a firefight. However, if you don't want to use Instinct, you can always switch it off. There are 5 difficulties the game can be played using, from the almost patronising Easy, to the mind meltingly intense Purist, where it's just you and Agent 47 with no Instinct and no map. The story, while simple and lacking in originality, is actually quite effective. For reasons I can't really go into, Agent 47 finds himself going against the ICA, and taking a young girl under his protective wing. Unfortunately, the ICA aren't the only ones trying to track this girl down, and Agent 47 soon finds himself drawn into the seedy world of strip clubs, arms dealers and pig mutilators. Lucky for you the player, this gives you more than enough moral reasoning to accept that none of these people deserve to live long and fruitful lives so, one by one, Agent 47 is despatched to eliminate them. The antagonists are like something out of a Frank Miller fever dream, and each time you think they've sunk as low as they can go, someone else comes along to lower the bar. You want to kill these people. Or at least, I did. The cut scenes are well rendered, with only a few blocky patches showing the game's seams, and can be skipped at any point for those who just want to jump into the action. 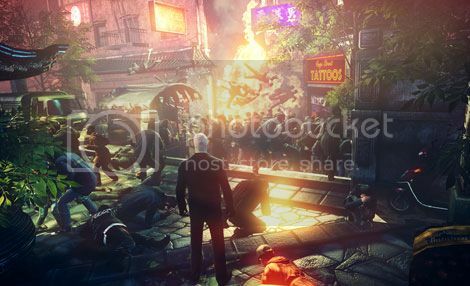 In game graphics are actually pretty impressive, as the environments are fairly well constructed, especially when populated with a large crowd, who will react to Agent 47's presence, and even offer him the ability to "blend in" when the heat is on. This is courtesy of IO Interactive's newly developed Glacier 2 Engine, which allows them to render up to 1200 dynamic NPCs on screen at a time. It certainly works, but the old familiar problems are still there, with identical bypassers and rent-a-goons popping up all over the place, and the classic repeatable dialogue loop, where an NPC seems stuck in a space-time distortion, doomed to repeat the same conversation for all eternity. All of this is academic, because the real question is: how does it play? Well, if I'm completely honest, I should have hated this game. The lack of decent checkpoints, the repetitive gameplay, the ability to blow 15 minutes of hard work with one wrong move. This should have had me throwing my controller at the ground with apoplectic rage every time an eagle-eyed henchman spotted me garrotting an innocent scientist (well, as innocent as the scientists in this game can get). And at times it pushed me close. I have never sworn so much at a game, been so completely disgusting about its improbable sexual habits and suspected family lineage. I called this game things that made my wife leave the room in disgust. But when, after the fifth or sixth attempt, my strategy paid off, the feeling of satisfaction that washed over me had me punching the air and roaring with joy. Each level is broken down into sections, with some checkpoints dotted around to help you on your way - you may have to look for them. If you die, or feel like you've blown the mission briefing halfway through a section and you haven't activated a checkpoint, you go back to the beginning of said section. Your game score is visible as part of the HUD, and at the end of the level, you are presented with a score breakdown. If you kill a whole load of people who AREN'T your specified target, you're going to lose points. But, silently despatch them with some piano wire, a well thrown knife or just a good old fashioned sleeper hold, then you can cancel the negative points out when you hide the bodies. You'll also lose points every time you're spotted, or a body is found. So, if you're a score junky you're going to have to be very careful. 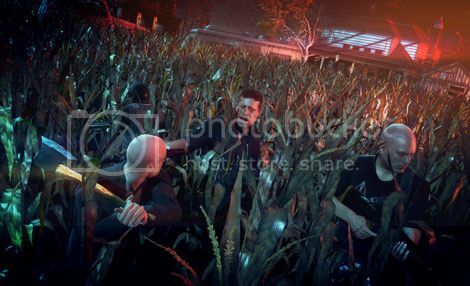 Hitman: Absolution requires a degree of patience that seems to be lacking in some gamers these day. The fact of the matter is, you are going to get stuck at some point. But, that just means you have to adapt your playstyle. On one of the latter stages of the game, I found myself pinned down in the starting area of a map, unable to leave the building and make it across the heavily fortified forecourt to my exit point. I tried in vain to sneak past everyone, killing only when absolutely necessary. As a result, I kept getting spotted, and then completely obliterated in the ensuing firefight. I was outgunned and outclassed. So, after an hour of playing the same level again and again and again, I decided to try something new. I found a sniper rifle, some proximity mines, and a nearby vantage spot with an easy to reach hideaway, and started picking off the enemy one by one. Each time they came to look for me, I placed a landmine and hid. It took me about half an hour to successfully kill everyone in the level, and it felt amazing. There were times when I almost blew it, when I came face to face with somebody hunting me down, so I just pulled out my silenced Silverballers, and shot them in the face before they'd even realised they'd found me. I may not have experienced the earlier games in the series, but I never felt lost or overwhelmed by game lore (as opposed to games like Metal Gear Solid 4, which are so steeped in their own mythology new comers should probably have to attend a series of induction lectures). At its heart this is a game that will relentlessly punish the player until they get their strategy right. If you want to sneak through the game, you'd better be damn good at sneaking, and if you want to shoot your way through, it's the same deal. But that's not to say you can't borrow and blend from each playstyle. You can go loud whenever you want, even if it's just for one level. Something else that you need to appreciate before you start playing: it is impossible to collect everything in your first playthrough. Try as you might to wear all the disguises, kill all the bad guys, press all the buttons, and STILL achieve the maximum score, it's never going to happen. However, instead of having to replay the game in its entirety, there's a level select option where you can play through your completed sections and improve your score, raise your kill count, or just spend some more time dressing up like an idiot. I'm not the biggest fan of online multiplayer in games - at my age, everyone I know has to set aside time quite a few days in advance for anyone to get any decent co-op action going. 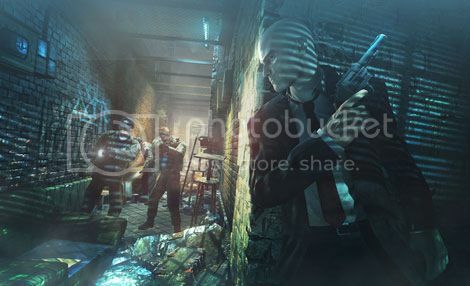 Luckily, Hitman: Absolution has an asynchronous online mode called Contracts. Any player can access any level in the game, mark an assassination target and then despatch of them in whatever way the see fit - for example, dressed as a cop, with a sniper rifle, without being spotted and with no missed shots. As long as you yourself can perform the assassination, then the contract can be created. From this point, you can create a competition and invite your friends to take on your contract. All they have to do is stick to the criteria of the contract, and try and surpass your score. If they do top your score, it's up to you to figure out how, and then top theirs. These competitions can last for days, and don't require players to be online at the same time. You can choose to like on another's contracts, and contracts with the highest ratings will be featured online for the entire community to play. From what I've played so far, there are some creatively sadistic people out there who know how to put a great puzzle together. In conclusion, in a week where I was pushed to breaking point, Hitman: Absolution was my salvation, albeit one that frequently made me apoplectic with rage. There are a few flaws here and there, but I found it to be one of the most satisfying games I'd ever experienced. There will always be die-hard fans who are averse to change, and there will always be noobs to a series (like me) who think it's the best thing ever. All I know is I had an insane amount of fun playing this game, and I think you will too.